I used to suffer from terrible migraines, often twice a week and severe. They seriously impacted on my life. Doctors tried me on all sorts of medications with little success. 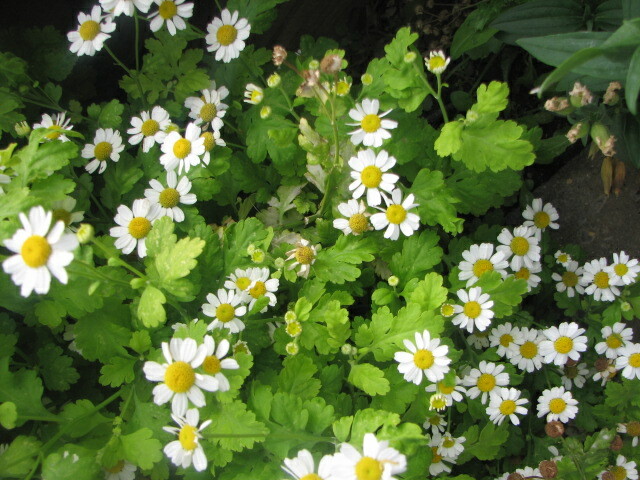 I discovered Feverfew in a natural health shop, took one a day for several months and from the first day I had no more. I have suggested this to quite a few people – some it helps, others not. The ones it has worked for, like me, swear by it. When I decided to grow my own medicine cabinet Feverfew was the first on the list. I bought one little plant and have had it popping up in spots in the garden ever since. It grows in pretty little bushes and I always leave one to seed. To use feverfew I either pick a few leaves and have in a sandwich with something nice, or I use as a tea. (With all my herbs for teas I actually pick a good sized bunch, blend with water and freeze in ice cube trays, store in small bags). This is a little bitter but not unpleasant and it will usually stop a headache when I feel it coming on. As with all herbs one should check on the net to find if there are any contraindications or side effects one should know about. I make this often. I usually have a bag of frozen banana pieces in the freezer in which I can just add any other frozen or canned fruit I have. 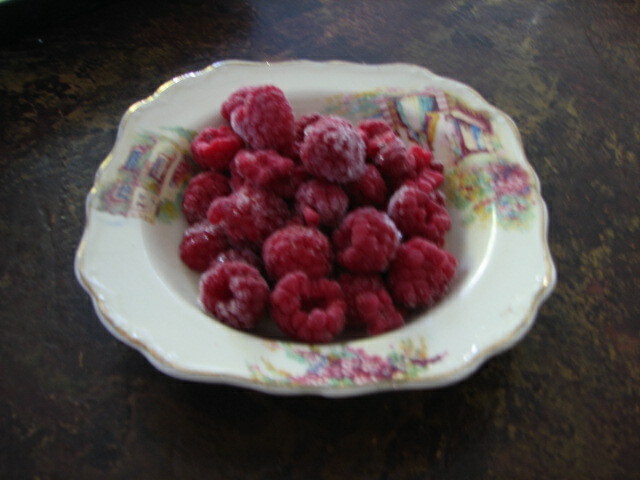 Yesterday was raspberries, grown in summer and frozen free flow. 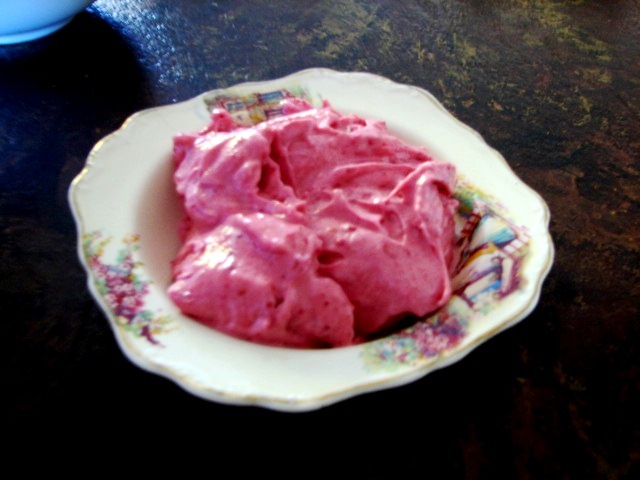 Just put frozen bananas (1 per serving is generous) into a kitchen whiz along with whatever other fruit you desire – I used around 1/2 cup of raspberries. The fruit must also be frozen. If you wish you can add 2 tablespoons of sweetened fruit yogurt or a little sugar or honey.Whiz for 2 – 3 minutes until it’s smooth and creamy. That’s all there is to it. Last week I made this with tinned mangoes, just drained and froze them for an hour and added 2 tablespoons of apricot yogurt. It was absolutely delicious. Now I am trying to cut down on food buying I didn’t have yogurt so just sweetened with a wee bit of honey. Bananas make a great base for frozen desserts. Just banana on it’s own done this way make a very good whipped cream alternative, I have seen similar recipes on the net with all sorts of ideas. What I will be trying soon is chocolate and walnut – bananas, cocoa, little honey and vanilla whizzed, and chopped walnuts folded in. 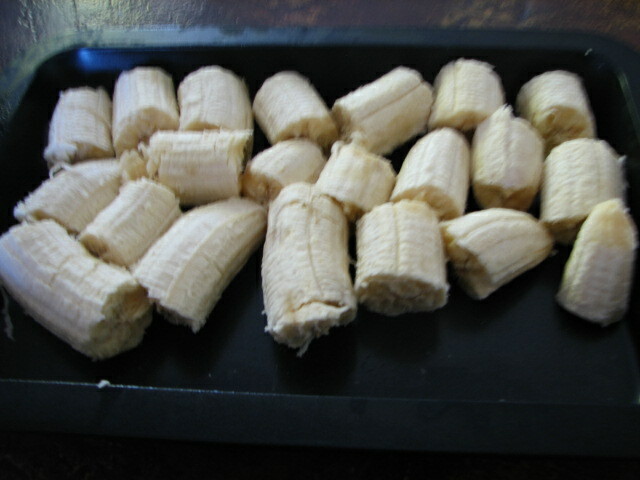 The bananas lose much of their flavour done in this way and you really just get the flavour of whatever fruit you are adding. Pulse sunflower seeds in food processor till rough crumbs. 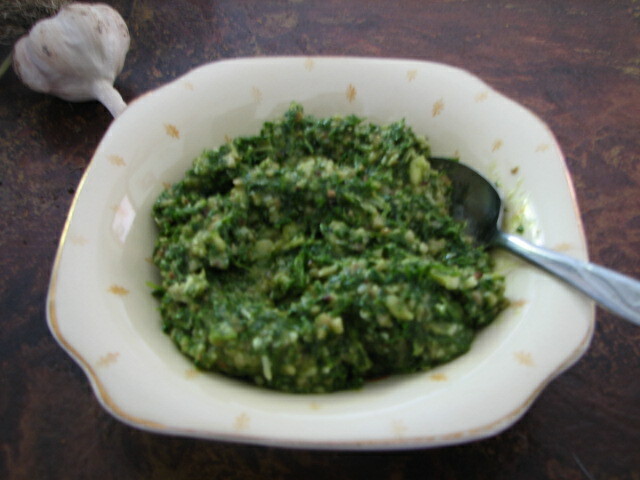 Add parsley, salt, lemon zest & juice and garlic, whiz till finely chopped and blended. Add parmesan, then pour in oil slowly while blending till the desired consistency. This is delicious. I have left some out for using, the rest has been spooned into ice cube trays and will be bagged when frozen. 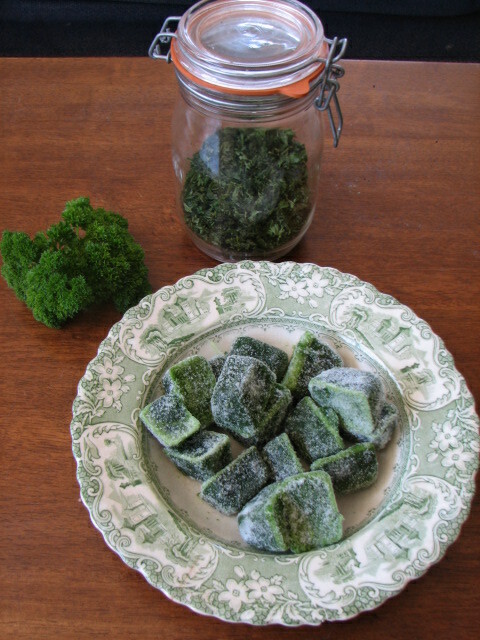 Usually I just dry my herbs but a tip I got off Pinterest was freezing them in ice cubes. I do some in water and others in olive oil, depending on their use. The water ones I use as a tea with an old vintage tea leaf holder, or in smoothies. The ones in oil are verrry handy for cooking. I have a mountain already in the freezer of coriander, oregano, basil, rosemary etc but just started on the parsley. I also have kale and spinach done this way for smoothies. I love this as couldn’t use it all up before and would have to replant often.